wow! 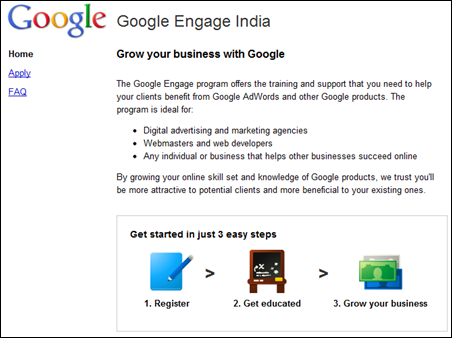 Google targeting Indian SME’s ! Search, Email, News – Google has done everything. It has become the world leader in search and doesn’t have anything much to prove in this domain to anyone. But then as pointed out in earlier posts, you can always count on Google to keep coming up with something new all the time. Their services such as Google News, Gmail etc. have already taken the world by storm. And now they have come up with two new initiatives – A new call center in Hyderabad which would be offering advertising solutions in Telugu, Kannada and Malayalam initially. Bengali, Oriya, Gujarati and Marathi would be added later on to complete an entire bouquet of vernacular languages. Google has also launched a program called “Google Engage” which would help businesses and individuals offering web related solutions. It aims to help these businesses learn about the ways to set up their online presence, maintain the customer service side of the entire business and therefore engage the local audience in a much better manner. But how will the SMBs use the Adwords platform? The SMBs would be encouraged to invest according to the earnings they have derived from their respective businesses. The cost would be dependent on the quality and placement of the ad. Google would have all the data regarding the number of clicks, click-through rates, number of clicks which have been turned through sales etc. to give a particular business the right kind of advice. Google is already so renowned across the country! So why does it see the necessity to localize its offering? India has more than 35 million SMBs and therefore no business can expect to flourish to its maximum without specially targeting this segment. Google has realised that its self service model of buying the keywords, setting up online campaigns and attracting visitors has worked with a large customer base. But most SMBs still require some kind of support and help to develop these campaigns and achieve some sort of success. This has led them to localise their offerings in a much better manner. Google’s localized approach has resulted in a phenomenal growth of about 95% y–o–y. The fact that Google has chosen India as its first location in the Asia Pacific for the launch the Google Engage program shows how much it values the SMB sector in the country. It has plans of reaching 2500 SMBs compared to the 1000 today. It also plans to conduct workshops and engagement events for SMBs to help them better understand the online advertising platform. This move from Google speaks of its interest in covering all the segments of the population with its different products. Such a move would keep it much above and ahead of its different competitors. Googlers keep innovating and we keep following! Airtel’s New Logo & Signature tune–Better or Worse? very well said. Google keeps on innovating and we keep on following.